Log in to the UKCloud Portal as an administrator. 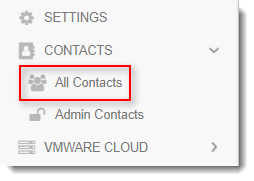 On the Contacts page, use the Search field to find the user to whom you want to assign or revoke vCloud Director permissions and then click the Edit button. In the Permissions for UKCloud for VMware section, you'll see a list of virtual data centres (VDCs) and the associated permissions available for the portal user. Select the permission level you want to assign to the user, then scroll to the bottom of the page and click Save. The first table shows the user types (operations); the second table shows the exact privileges each user type has.